Slamdance remains the little festival that could, a throwback to analog film festivals of the early 1980s, with their cinema-obsessed audiences and packed makeshift screening rooms. A halcyon age of innocence, before the onslaught of marketing, branding, corporate sponsorship, publicists, producer reps, agents, and social media. At Slamdance there’s still no red carpet and no one checks your bags or makes you open your coat for inspection before entering every screening. Nonetheless every year Slamdance, with its tiny slate, upstages Sundance with one or two films that soar. This year’s not-to-be-missed Slamdance film is Stefan Avalos’s Strad Style. 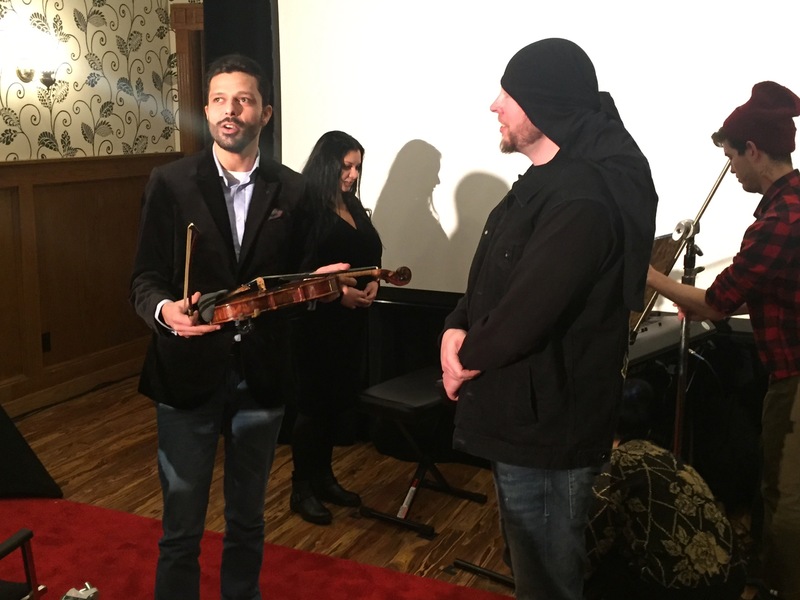 Strad Style has more than enough quirk to win a slot in Sundance’s U.S. Dramatic Competition or edgier Next and New Frontier sections. The main character is a societal outlier with a taste for Steven Van Zandt headscarves, who survives rural Ohio winters alone in a derelict farmhouse without heat, his bipolar disorder mostly under control. His waking hours are preoccupied with the 18th-century rivalry between the Guarneri and Stradivari violin makers of 18th century Cremona, Italy. Online he friends an acclaimed Romanian violinist, Razvan Stoica, on tour in Europe. He Facebooks his new friend with an offer to build a replica of the famous Guarneri played by Paganini, “Il Cannone,” the Cannon, named for its fiery, booming sound. Can it be ready for an upcoming concert in Amsterdam?, asks the violinist. Almost done with it, replies Danny Houck. Except that we in the audience know otherwise. Strad Style, however, is a documentary, not a fictional contrivance. It’s a beautifully shot shaggy-dog story with an overcoming-adversity theme and fairy-tale outcome Hollywood would kill for, which leaves audiences applauding through tears. Where could a work like this fit into Sundance’s U.S. Documentary Competition, in which every film this year (perhaps one exception) contains an urgent social justice or environmental theme, along with an impressive credits list of major foundation support? I’m all for social-justice documentaries, having filmed them in El Salvador during the war, Chile during Pinochet, northwest Pakistan after the earthquake. And I do realize our precarious moment in national and world politics. But I, too, once programmed a documentary festival (New York’s “docfest” in the late 1990s) and must point out that nonfiction film as a narrative form can be every bit as faceted, poetic, open to idiosyncratic expression, even whimsy, as written nonfiction. (Think Grey Gardens, early Werner Herzog.) If Sundance documentary programmers understand this too, it’s not much in evidence in this year. It’s worth noting that Strad Style is a true independently produced documentary. No institutional support in the credits. When Stefan Avalos, a violinist himself, followed his gut instinct that Danny Houck would prove a compelling subject, he had no way of knowing what would transpire after he began filming, or how any of it would turn out. Or how long he would continuously have to film to collect enough of a story to make a worthwhile film. How do you frame any of this as a proposal for a program officer? In other words, Avalos — who envisioned, shot, sound-recorded, edited, animated, produced & directed — green-lighted himself. Incidentally, Clean Hands, a 10-minute documentary short screened before Strad Style, is a small masterpiece in tongue-in-cheek filmmaking. I’m originally from the buckle of the Bible Belt, but I’ve never seen anything like the Daytona Beach Drive-In Christian Church, a cross between a mega-church and drive-in movie. Worshippers sit in the comfort of their cars, parked on a huge lawn, and tune their radios to a pastor giving his sermon from a towering outdoor pulpit in the distance. A sealed plastic container of wine and minuscule square of bread constitute communion at the steering wheel. Along comes a golf cart with a tithing basket. As metaphor, all of this is off-the-scale. Lauren DeFilippo’s direction, shooting, and editing evince a dry observational style reminiscent of Errol Morris in his early Vernon, Florida days. Brilliant stuff.